Email marketing is one of the most effective forms of digital marketing. Email marketing builds relationships, has a 4,300 percent ROI and is 40 times more effective in getting customers than social media. You may have recently launched your own email marketing campaign; However, you may be wondering why it isn’t working. Here are 10 email marketing mistakes to avoid. This is a common email marketing mistake many new marketers are guilty of. A strong subject line is one of the main keys to getting your targeted audience to open your emails. With a less than stellar subject line, people won’t be interested in opening your email. You may be wondering, Well what makes a strong subject line, then? Well, Many things. Implementing a short, catchy subject line will entice your audience to open the message. A subject line that gets cut off in the inbox preview isn’t as effective. You also should have a subject line that is conversational. Email marketing is a personal approach to connecting with your audience; don’t be overly stuffy! When it comes to reading content online, readers don’t want to read long pieces. The same goes for emails. Considering the fact that people can access their email on their mobile phones, you don’t want to put out content that is too long. No one wants to spend an eternity scrolling down on something they’re reading! You can avoid the mistake of sending too long emails by keeping your writing concise. Make sure every single sentence adds value to your readers — but don’t let your content sound flat! Short, engaging emails are the way to go when it comes to email marketing. Keep it fun, but keep it quick. This email marketing mistake is similar to a mistake that can be made on social media: putting out your content at the wrong time. If you don’t want your email to get buried in your reader’s inbox, be sure to send emails at the correct time. Think about it: how many times do you check your email throughout the workday? You might catch up on emails during your lunch break. Something sent around that time might be the first thing you see in your inbox; anything sent earlier might get lost in email clutter. To figure out when prime sending time may be, consider using A/B testing tools. As stated earlier, targeted email marketing is a personal approach to interacting with your audience. Your copy should directly relate to that audience; if it doesn’t, readers can easily be turned off. If your targeted email marketing campaign is related to growing a website’s SEO, you want to make sure that your copy is targeted toward people with a blog. If you write in a tone that doesn’t relate to that audience, readers will not be interested. Learn as much as possible about your targeted market early on. Learn about its wants, needs, and interests. The more you know about it, the easier it’ll be to focus your copy on the language it can relate to. One of the most common email marketing mistakes, it’s most people read their emails on a mobile device. Having your email marketing campaign optimized for mobile reading is crucial. If your emails look warped, too big, and are slow to load, readers can be less likely to read them. Your emails should look professional — and part of achieving that is by making sure they look good on a mobile platform. Part of a targeted email marketing campaign looking professional is your copy being error-free. Pristine writing means there are no grammar mistakes, spelling errors, or clunky sentences. If you don’t have someone to edit your emails before you send them out, considering using a browser extension such as Grammarly. The free app catches your mistakes as you are making them, and even gives suggestions on how to fix them. A huge email marketing mistake you could be making when it comes to your targeted email marketing campaign is not tracking the results of it. Tracking results are how you can learn about what’s working and what isn’t. Did you try a new format? Did you move your call-to-action? It’s important to note when you make changes, and how performance was affected as a result. You can track results using Google Analytics or another similar tool. This is one of the top email marketing mistakes of all time. Bombarding inboxes with your emails is a sure way to lose subscribers. To prevent overloading your readers, consider scaling back on how many you send out. Instead of sending multiple emails a day, consider sending one per day, or one per week. On the other hand, be sure to not be sending out emails too infrequently. If you don’t engage your readers regularly they’ll start to forget you over time. 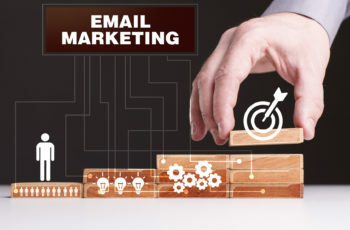 The frequency varies from business to business, and finding a healthy balance between the two will help increase your email marketing campaign’s open rates. The point of a targeted email marketing campaign is to get your readers to do something beneficial for your product or brand; a call to action (CTA) is how you make those conversions. If your call to action is unclear, your efforts will be a waste! Be sure to keep your CTA clear, concise, and in plain site. Incorporating a CTA as a button can be an effective way to make sure readers see it — and click on it! Check out this article on how to create an effective call to action button. You can’t win every reader; there will be people who unsubscribe from your targeted email marketing campaign along the way. Something to keep in mind is that this is okay. It happens. If your unsubscribe process is ineffective (or if you don’t even have one, yikes), people can start marking your emails as spam in order to remove them from their inboxes. This can definitely hurt your credibility as an email marketer. Be sure to have an effective unsubscribe process! Overall, a targeted email marketing campaign can produce great results — if you avoid common email marketing mistakes. By keeping copy short, subject lines exciting, and calls to action clear, your email marketing will be effective in no time! If you’re looking for more ways to strengthen your email marketing, be sure to check out our email marketing section of our website.